When it comes to the Penguins and goaltending, the conversation is usually about Marc-Andre Fleury. Over the past two weeks, the conversation has been about his four-year, $23 million extension. Can he live up to it? Is he good enough for the Penguins? Buried beneath all of that, two days prior, was Thomas Greiss saving 33 of 34 shots he faced against the Minnesota Wild to earn his first win in a Penguins uniform. A very important first win after getting his first taste of a Penguins meltdown against the Detroit Red Wings two weeks earlier in his first start with the club. He also may be the first sufficient back up to Marc-Andre Fleury in quite some time. Brent Johnson served as someone to give Fleury a rest. Tomas Vokoun was somewhat of a chaser to keep Fleury on his toes. He was also there to replace Fleury if warranted. We saw that in the 2013 playoffs. Jeff Zatkoff was merely the alternative when Vokoun was out. While his career in San Jose is what most remember him for, Greiss has hardly made a career out of being a back up until recently. Drafted 94th overall by the San Jose Sharks in the 2004 draft, Greiss didn’t see his first NHL start until 2007, failing to record a win. He would continue earning his NHL starts by waiting for the phone to ring while playing for the Worcester Sharks until the 2009-2010 season. Greiss spent the 2010-2011 season in Germany and returned to the NHL for the 2011-2012 as the back up for the San Jose Sharks. However, with goaltender Antti Niemi starting 68 games, that left Greiss with only 14 starts and 5 replacements. He wouldn’t see his first season of full back up work until the 2013-2014 season with the Arizona Coyotes. Starting 25 games with a .920 SV% and 2.29 GAA, Greiss proved he was ready for the back up role. However, it came as a shock to many Penguins fans when Jim Rutherford signed him to a 1-year, $1 million deal. His first win came against the Minnesota Wild. Thanks to a three goal cushion and a disallowed goal, Greiss walked away with his first W and a .971 SV%. However, his best win thus far came last night against the Toronto Maple Leafs. It was a highlight reel night for Greiss. Stopping 30 of the 31 shots he faced in net, Greiss robbed the Leafs for nearly all 60 minutes. His best work was saved for the end, preventing a game-tying goal in the final minute of regulation. Greiss is as solid as it gets for a back up. Not someone who’s going to run off and try and be a starter. Not someone who’s going to be bouncing back and forth between call ups. Not someone who’s going to be hot and cold. You know you’re going to get a solid start out of Greiss every time you give him the chance. Compared to what the Penguins paid for Tomas Vokoun, Greiss is a steal. 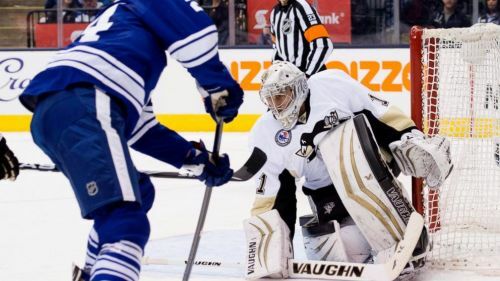 While everyone is still focused on Marc-Andre Fleury’s contract and anxiously awaiting the arrival of Tristan Jarry, what about the years between then? Who’s the back up? The Penguins will be actively trading at some point this season, and it would come as no surprise to see Zatkoff in any package. Just don’t bury the idea of Greiss sticking around in Pittsburgh for a few more years.